JERUSALEM—Warning of Egypt’s possible collapse under economic pressures and the threat of rampant terror, Egyptian President Abdel-Fattah al-Sisi called on the United States over the weekend to resume military aid that has been partially frozen because of the political coup that brought Sisi to power and because of alleged human rights violations. Terming Egypt, with its population of 90 million, "the bedrock of stability in the area," Sisi told television interviewer Charlie Rose that if Egypt is destabilized it would have an impact on neighboring Israel and on Europe as well. "Egypt is facing many threats and its public wants to see a big response from capable countries that can supply assistance. Suspending delivery of equipment and arms is an indication to our people that the U.S. is not standing by Egypt. 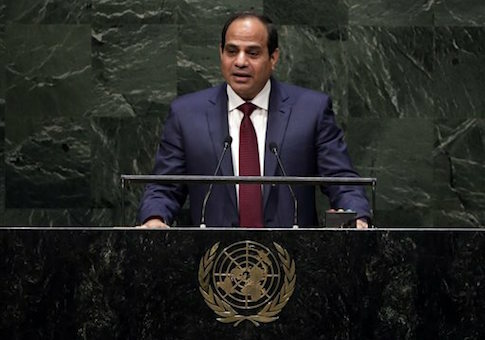 Our need for weapons is dire," Sisi said. More than 300 security men were killed last year in northeast Sinai in battles with extremists linked to the Islamic State (IS). Last month the Egyptian air force carried out strikes against terror centers in Libya following the beheading of 21 Egyptian Copt Christians in Libya by Islamists. Washington’s attitude toward Cairo has been reserved since the coup two years ago against the democratically elected government of Muslim Brotherhood leader Mohammed Morsi and the subsequent election of Sisi, the former army chief of staff, in Morsi’s place. Washington has suspended part of its $1.3 billion annual package of military aid to Egypt to signal its displeasure at the way the Morsi government was ousted. Many of the Brotherhood’s leaders were imprisoned and hundreds of demonstrators killed. Washington has also expressed its displeasure over human rights violations such as the imprisonment of three al Jazeera reporters for "damaging national security" through their reports on the crackdown on the Muslim Brotherhood. One of them, an Australian, was deported last month after a year’s imprisonment and the other two were released on bail. Sisi expressed regret at the arrest of the three in his interview with Rose, saying "They should have been released immediately." Noting that he had not been president at the time of the arrests, he said he could not intervene once the judicial process had started. He said the Morsi government had not been overthrown by the army but by the Egyptian people because it was imposing a religious state and not moving toward the pluralistic and inclusive state Egyptians wanted. "We are trying to uphold human rights but we need the world to understand our state of affairs." The president said that Egypt, which has received American economic and military aid for decades, needs it now "more than ever." Asked his view of American leadership in the Middle East at the present time, he chose to sidestep what he termed "a difficult question." Sisi appears to enjoy growing support in Congress because of the determination he is showing in the battle against Islamist terrorists at home. The chairwoman of the House panel which has jurisdiction over foreign aid, Rep. Kay Granger (R., Texas), threatened last month to withhold aid to other nations if the State Department did not authorize release of F-16 fighter jets and M-1 Abrams tanks promised to Egypt. Rep. Lois Frankel (D., Fla.) said at a House Foreign Affairs Committee meeting that Egypt was an ally in the battle against the Islamic State. Secretary of State John Kerry said that a decision on the issue would be made shortly on the freeing of up to $650 million in military aid presently frozen. Kerry attended an Egyptian economic conference held over the weekend in the Egyptian Sinai resort Sharm el-Sheikh, where he met with Sisi. The turmoil that has engulfed Egypt since the ouster of President Hosni Mubarak four years ago and the almost total loss of tourism, a major income earner, has sapped Egypt’s economy. At the conference, Saudi Arabia, Kuwait, and the United Arab Emirates each offered Egypt $4 billion in aid. Sisi called on these countries to join with Egypt in building a united Arab force to fight Islamic terror groups. This entry was posted in National Security and tagged Abdel Fattah al-Sisi, Egypt. Bookmark the permalink.